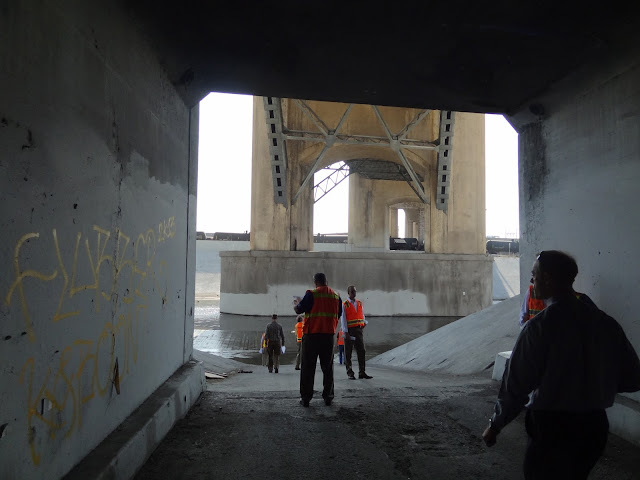 A photo of the two steel arch spans of the Sixth Street Viaduct across the Los Angeles River. I was surprised that there was a large pedestrian undercrosssing that could potentially allow someone to drive their car onto the concrete-lined river. Perhaps that's how they bring cars into the river in the movies? Note how the arch ribs look strange due to the skew of the bridge in relation to the river. Because of the angle, the piers pick up the arch lower on one side because they are closer. Also note how a homeless person has set up a home in one of the pipes that empties into the river. Los Angeles County, California Bridges: Sixth Street Bridge across the Los Angeles River (3) by Mark Yashinsky is licensed under a Creative Commons Attribution-NonCommercial-ShareAlike 3.0 United States License.